In 1985, Rotary declared basic literacy to be a pre-condition to the development of peace. Through this organizational emphasis, more than half the world’s 34,000 Rotary clubs address the full range of literacy and mathematical challenges for primary, vocational, and adult learners as well as teacher training. 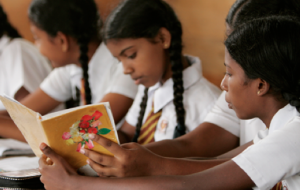 Many Rotary club members promote what is termed “lighthouse” literacy projects – which utilize the Concentrated Language Encounter method (CLE) – those that can be replicated easily, thereby increasing the scope of their impact. Lighthouse literacy projects have been created for formal schooling, older children who are not in school, functionally illiterate adults (particularly women), special groups, and teacher’s training. The purpose of these projects is to inspire, guide and support national authorities toward alleviating mass illiteracy in developing countries. In Thailand, for example, the “lighthouse” literacy effort has been so successful that the government adopted it as a national program. Similar literacy initiatives have been sponsored by Rotary clubs in Australia, Bangladesh, Brazil, and South Africa. Early literacy training is critical to the success of a child’s later education. Rotarians work with children, parents, and educators to encourage and build reading skills at an early age. In 2004, Rotary clubs in Brazil established Educafé, a primary school for the children of coffee farmers in a remote part of Bahia State. Previously, 80 percent of local children had not attended school or received regular meals. The school provides education, meals, uniforms, transportation, books, supplies, and preventive health care for nearly 80 children. Many adults in both the developed and developing world lack the skills they need to hold a job or perform basic tasks required by everyday life. The hardships caused by illiteracy, from the difficulty in finding employment to the constant pressure to cover it up, often lead to a host of other problems. In Turkey, nearly 10,000 adults – 95 percent of whom are Kurdish Turkish women – have participated in Rotary’s CLE programs, where they acquire basic literacy skills and vocational training. Similarly, Rotary members in Egypt have managed a CLE program that has provided nearly 5,000 students with basic literacy skills, reproductive health education, and sewing instruction. Because girls do not have access to education in many parts of the world, the illiteracy rate among women exceeds that of men. Studies of illiteracy rates in low-income countries have shown a 20 percent difference between the genders. In 2008 the New Zabuli Education Center, a free year-round school located 30 miles outside of Kabul, Afghanistan, opened for girls who were not educated under the Taliban. Funded and organized by a United States Rotary club, the center has enrolled 200 children, ages 4-15, and classes for adult women are planned. In Jalalabad, the Rotary Club of La Jolla Golden Triangle, San Diego, Calif. USA, has supported numerous educational initiatives for girls and young women, from elementary school through the university level for over a decade. Error: Error validating access token: Session has expired on Friday, 01-Mar-19 13:00:41 PST. The current time is Wednesday, 24-Apr-19 21:28:55 PDT.